When people ask me what I do as a homebuilder, I often compare my work to that of an orchestra conductor. My sheet music is the plans and codes/regulations and each supplier and sub-contractor is an instrument section. It is my responsibility to orchestrate all this so it is pleasing to the homeowner, just as if it were an orchestra playing a Bach concerto. This is a sizeable undertaking when you consider all the different systems, materials and trades which are involved in the construction of a home. The satisfaction I receive in return for my efforts is largely what drives me in achieving my goal. Knowing I am able, in cooperation with all my suppliers and trades people, to build a home that will serve a family for many years provides me with an awesome feeling of accomplishment and pride. A home is much more than just a house. It is a place where a family will grow and develop and experience many life-defining events over the years. How does one learn to be a builder? In large part, it is on-the-job experience that best teaches one how to be a builder. Developing trust and relationships with your clients, suppliers and trades people is the number one most important attribute of a builder. Creating an atmosphere of mutual respect and trust is the foundation for long-lasting partnerships. In the end, a builder has an enormous task of providing their client with the home of their dreams. When that task is complete, there is an enormous feeling of accomplishment and pride. A good builder will share and instill this feeling of accomplishment and pride with their suppliers and sub-contractors. After all, it is a team effort! 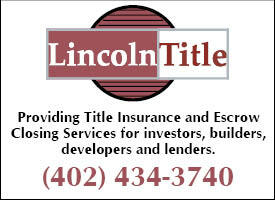 We are just coming off the 47th Nebraska Builders Home and Garden Show and it was a great success. Thanks to our wonderful staff who orchestrated the show and to all the exhibitors for your time and hard work. The Chili Cook-Off is March 11 and the deadline for contracts for the Tour of Remodeled Homes is March 4. The Construction Career Fair is March 26 at SCC-Lincoln.